I finally showed 96 framed photographs of Under Tracks at The Underdog Gallery. The exhibition was extended to run over a week following the superb publicity I received..... a 25 minute prime-time interview on The Jo Good Show on BBC Radio London... top online listings in both The Londonist and The List. Oh, and in The Brixton Buzz. The publicity generated exceptional footfall through Underdog – a wonderful mixture of.... lovers of photography..... railway arch buffs ..... tourists just passing ..... the Chairman of Network Rail ... Even a couple of ex-Fleet Street darkroom printers who had come to see "real photographs"! I'm glad to say they were very complimentary about my work. I was delighted that several of my photographic subjects came to the show to see 'their' photographs. It gave me great pleasure seeing their reactions to the final printed image. With just less than a month before the Under Tracks exhibition at Underdog, I finally get to one of the truly unique arch locations in London, Flying Fantastic in Southwark. I first went there shortly after they opened last Autumn, and decided that I needed as much natural light as possible – hence waiting until this Spring. Flying Fantastic? It's an aerial gym (think trapeze artists etc.). Edel, the owner, had organized four of her finest aerial exponents for this shoot and brilliant, just brilliant, they were. Lisa, Vicky, Ali and Danyelle performed with lithe dexterity many metres in the air, whilst I shot from the safety of the floor. A great photographic session to end this project. Another visual omission from Under Tracks is a garden centre. My internet research of London SE15 reveals one such business near Nunhead Station, so that is where we start today. Peter at The Nunhead Gardener stands in his leafy surroundings as I click the shutter. He tells me his little arches were once part of the original Nunhead Station, which is now located across the road. At Peckham Queens Road, we meet Simon carefully polishing a Lotus car. No, it’s not another auto business… Heist Vintage and Antique renovate and restore model cars for small children – the type that a child would pedal along on the pavement. They are beautiful examples which I’m only too happy to photograph. This is going to be a long days trek. 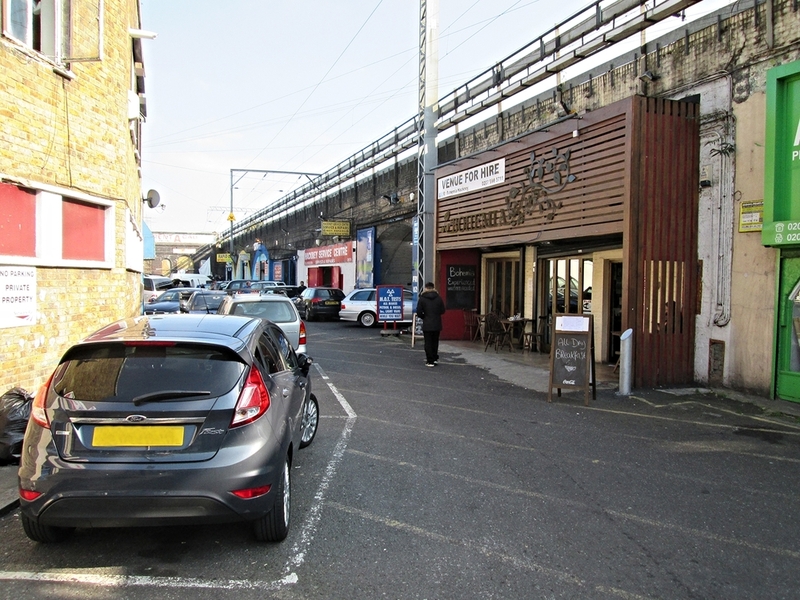 We pick up the railway arches to the west of Hoe Street, as we walk south towards Leyton Midland Road. It’s not too long before we meet Nick, a props builder, at Rule One Productions. He makes props for stage productions and gladly poses with a fine example of his work. Beyond Leytonstone High Road we find one of the most interesting arches I’ve come across on this project. The couple in the arch are making three dimensional works of art for sale in a gallery in Paris. The art we see being produced is a 3D revolver that is maybe 6 feet across. The form of the gun is made of variously coloured pentels, of differing lengths, glued on their ends to stand vertically. Amazing! Unfortunately I cannot say who the artist is, as he has a ‘no-publicity’ contract with the French gallery. I did capture the scene, but I’m not sure that I will be able to use the photograph because of his contractual obligations. As we near Wanstead Flats, the railway arches run nearby rows of terraced houses. The Wanstead Tap is their local watering-hole. Probably very busy in the evenings and at the weekends. It is dark in here…. lo-lo lighting, so I use the tripod and Pentax67 hoping for the best. Just down the road (or tracks) we smell food, and meet Despina and Fani in their kitchen at Pan’s Greek Food. The girls are preparing traditional Greek dishes for a function the next day. The arches continue towards Wanstead station, but it’s now late, so we head off home – the end of a good days work. Last November, I visited the arches to the north of South Bermondsey and became aware of an expanding stretch of “foodie” arches that traded on Saturdays... Time for a revisit? Dynamic Vines in the old Spa Station arches was the first stop. I had pre-visualised the shot here, and Laura and one of her customers, Guillaume, were happy to sample a wine or two with me clicking the shutter. A great shot that I’m particularly pleased with. Next, to the Ice Cream Union. Again a positive response and a fine image captured as Sara offered us a free cornet (yummy!) for being involved. Thanks Sara. At the Dockley Road arches, the customers and tourists were plentiful on this sunny Saturday morning. I’m constantly aware that I have to vary my photographs, and Jonah and Chun were willing to chat away with their heads appearing behind a graphic display of Kernel Brewery bottles. Just next door, a big queue –“Wait here to be served” – at The Ham and Cheese Company. I lurked until the composition looked just right... Click! Another candid shot taken adjacent at Crown & Queue who sell cured and prepared meats. Then to The London Honey Company where Charlie was not happy at me recording his display of honey jars until he had re-arranged it all! We learnt a lot here about how their different honeys are sourced. A great stretch of arches and some superb scenes captured. Kernel Brewery – the essence of micro-brewing. Next to familiar territory as we walk along Enid Street… and find another new micro-brewery. The punters were outside enjoying a beer in the sunshine at BB№ (Brew By Numbers). Again, candid shots here worked best. Then a surprise revisit to Scooterworks. Their café has only been open a few weeks, in the adjacent arch to where all the scooters are sold and repaired. I knew immediately that this café was going to make a great photo location, and the two young lads serving, Kyle and Vicente, beavered away whilst I reeled off a few frames using the Pentax 67 on the tripod. Then on to Druid Street, which was busy as it was lunchtime and the foodie and brewery outlets were thronging. At Ropewalk we lunched in the arches at the St. JOHN Restaurant. I’ve mentioned previously the need to vary my shots, and here was another opportunity. I asked the maître d' if he and the two waitresses would pose under their chalkboard menu. Jose agreed, and Lucy and Rosie joined him. A lovely atmospheric shot that adds the visual breadth that this project requires. Glowing with oven pride – St. JOHN Bakery and Restaurant. I recently received a catalogue from Sotheby’s for their upcoming Made In Britain auction on March 16th. The front cover features a Bill Brandt photograph, Bermondsey Policeman c1930–39, but this is not the image as I know it... or is it? This Sotheby’s image is 1000% “Bill Brandt Black”. Over the last few years I’ve collected every Lilliput magazine that features Bill Brandt’s work and I’ve catalogued it all. In the May 1946 issue, Brandt produced an eight-image photo-essay: Below Tower Bridge – a collection of photographs taken in and around Limehouse, Wapping, Bermondsey and Shadwell. And there it is: the policeman standing in Horselydown New Stairs, Bermondsey; but this photograph appears to be taken in daylight, shows a fair amount of detail and mid-tone grey, and is a reverse of the Sotheby’s catalogue version, which was printed in the early 1980s. My list of ‘return visits’ has been getting longer and longer, so time to tick a few off. We start in south London at Herne Hill with Dallas and Angel at the DnA Factory. They are on good form preparing for their own exhibition of their sculptures in November. Using both my medium format Pentax67 and 35mm Nikon FE, I shoot about a dozen frames of them ‘at home’ in their comfy arch surrounded by their art. North to Haggerston and Headway East – an art studio supporting people affected by brain injuries. Permissions were required not just to shoot here, but also from their clients to be photographed. I take several long-shots past the ‘artists' arm with the artwork-covered arch in the background. On our way to our next appointment we walk past The WhitePepper in Acton Mews – a women's fashion store/showroom. Amazingly, in seven months of shooting Under Tracks, this is the first fashion outlet I've encountered. Ines is fine about shooting here – some nice images captured. Further south, in June, to Herne Hill. I had done some research for this trip and discovered the Bath Factory Estate lying behind the shops off Norwood Road: a long run of arches with two great locations at each extremity. Firstly, and thirstily, to the Canopy Beer Company where Estelle, the ‘landlord’, welcomed us and happily posed behind her bar. Nice shots! ‘sculptural assemblage or tableaux, collage and photomontage which merge observational reality with myth and story telling to a most thought provoking effect’. I knew I needed to shoot this location and get it right… We will return with a tripod and my medium format Pentax 67. Nearby Herne Hill Station we found Off the Cuff, a live music venue, which amazingly also sells the furniture you sit on to watch the bands. Another revisit needed here, this time in the evening for the band and the crowd.